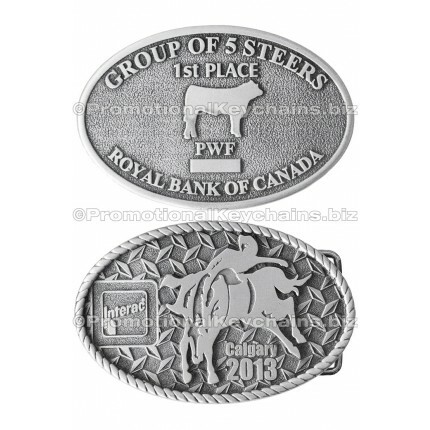 A 100% custom designed quality accessory at great pricing, our custom belt buckles are available in three unique styles to make your own — antiqued metal, polished metal, and genuine solid pewter. Each has it's own unique look, and our talented custom department staff is available to help refine a design you may have, or to develop one based on your input. The detail is amazing, and we round our buckles a little to naturally fit your body — and as form follows function, it looks nicer too. A retail quality product that will get lots of attention of use, they make a great choice for promotional use, as a commemorative item, as a reward to others, for resale, and more. Our best selling custom buckles — made to order belt buckles with or without color featuring antiqued brass, genuine gold, copper and genuine silver platings. Through the antiquing process, raised elements become brighter than — and stand out beautifully from — the darker recessed areas. Fantastic detail, and a very elegant appearance. We can also customize the backside if desired, which is a very nice touch. Pantone color matched fills are available in the antiqued buckles and looks great, slightly recessed, and the metal looks raised. 3D is available, and looks particularly beautiful when presented via the antiqued process. Our buckles are available in 2" x 3", or 3" x 4" sizes. They can be custom shaped too — in that case they just need to fit within one of the two sizes. 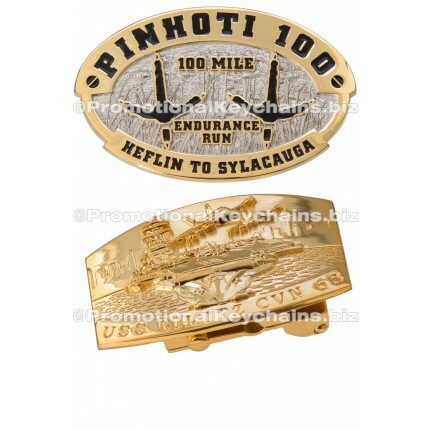 Our custom belt buckles are a very nice thickness and feel quite substantial. We also round our buckles slightly to naturally fit the contour of the body — and it also simply looks a lot nicer than a simple flat buckle. Does anything else have quite the lustrous and satiny allure of solid pewter? 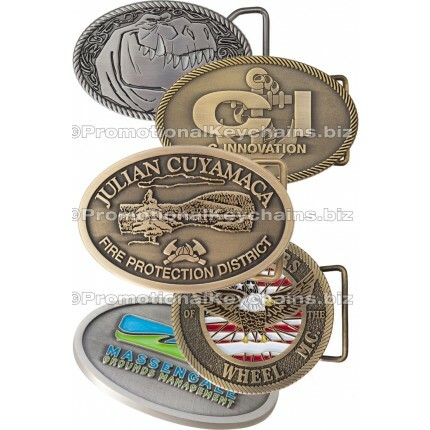 These 100% solid pewter custom belt buckles make a very positive statement. Their sheen is unmistakable. They feature wonderful detail, and we offer them in 3D as well. Pantone color matched fills, if desired, look great — slightly recessed into the metal. Our pewter buckles are available in 2" x 3", or 3" x 4" sizes. They can be custom shaped; the final buckle simply needs to fit within one of these two sizes. Made with a high quality thickness substantial feel, we also round our buckles slightly to naturally fit the contour of your body — and also because it looks so much nicer than a simple flat buckle.